Ragab obtained his Bachelor of Arts from Alexandria University – Faculty of Commerce in 1984. 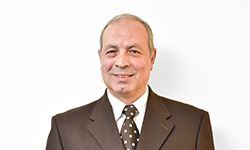 He is an experienced patent agent with years of experience dealing with the Egyptian Patent Office. He’s been at Eldib & Co. for nearly 20 years and is an expert in all matters pertaining to patent registration and prosecution.